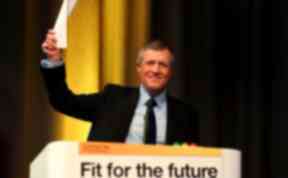 The Scottish Lib Dem leader believes his gender-balanced team will provide "strong liberal voices". Willie Rennie has included a majority of female spokespersons in his party's top team for the next parliamentary session. The Scottish Liberal Democrat leader and his four fellow elected MSPs - all of whom are male - have been handed policy portfolios. With tax-raising powers coming to Holyrood from April 2017, Mr Rennie has appointed himself finance spokesman - mirroring Kezia Dugdale who has taken on the task for her party. Making his announcement, Mr Rennie declared himself proud of his team, who he believed put the party in "the strongest possible position" to take the party forward over the next term. He said: "Scottish Liberal Democrats have punched above our weight over the last five years at the Scottish Parliament and the team announced today will help ensure that we continue to lead the agenda. "Our party is full of talented people and I am delighted that senior party figures outside of Holyrood will play a leading role in driving our policy agenda forwards for the next five years. "They have contributed a huge amount to the communities they serve, from councillors to campaigners, and bring a wealth of experience to the team. "This gender-balanced team will provide strong liberal voices inside and outside parliament. These appointments will put the Liberal Democrats in the strongest possible position to grow over the next five years." Former leader Tavish Scott will take the education and sport brief, while Liam McArthur has been appointed justice and energy spokesman. New MSP Alex Cole-Hamilton becomes health spokesman, while Mike Rumbles, who returned to the Scottish Parliament five years after losing his seat, will be both the rural affairs spokesman and the party's business manager. Carolyn Caddick, a councillor in Inverness, will be the party's economy spokeswoman, with fellow councillors Eileen McCartin and Karen Clark appointed to speak on culture and social security respectively. Katy Gordon, who was top of the Liberal Democrat list in the west of Scotland region in May but failed to get elected, is to be chair of the 2017 local election campaign. Party convener Sheila Thomson will be the children's spokeswoman, while Scottish treasurer Caron Lindsay takes on social security. Christine Jardine, who stood against Alex Salmond in the Gordon constituency in last year's general election, completes the team with her appointment as environment spokeswoman.